It’s almost that time. Time to replace the Christmas tree on the front porch with Spring flowers. Yep, the fresh fir tree I bought at Christmas is still on the porch. It’s a bit dry and brittle now……okay more than a little. The tree sure looked good when it was alive and the galvanized mop bucket on wheels was the perfect container for it. You guys know how I love using unique containers to display my outdoor plants and flowers. No boring plastic containers for me. Finding the containers has never been a problem for me. I usually pick them up at my favorite junk shop. It doesn’t really matter if they are in perfect shape. Galvanized buckets, coal buckets, anything rusty or crusty is great. Some of my containers are rusted out and holey on the bottom. That’s okay……built in drain holes for the plants. 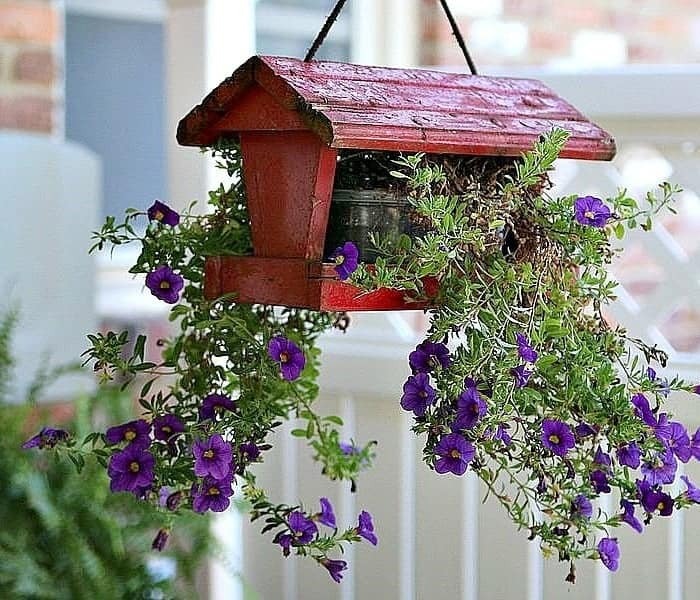 The bird feeder turned hanging planter in the picture above is one of my favorite upcycles. 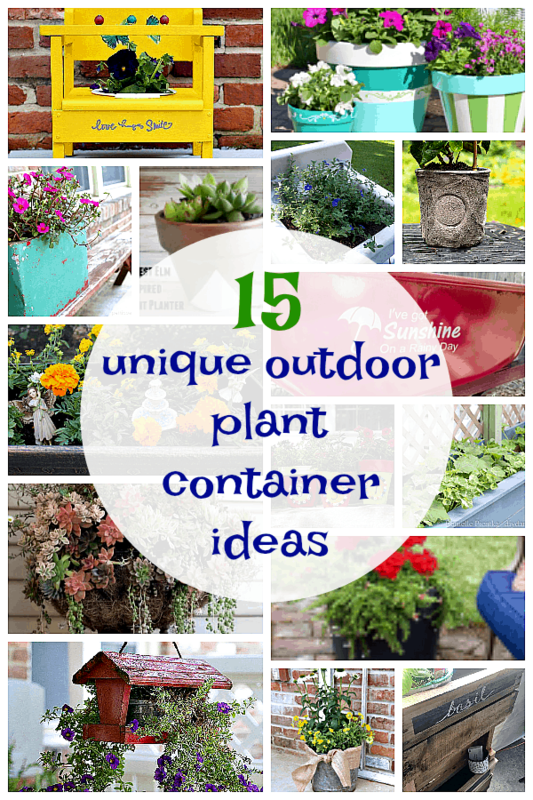 I gathered a few other favorites …..some mine….some from other DIY’ers…..for plant container inspiration. Some of these outdoor plant containers flat out make me smile. These past few days have been unseasonably warm here in Tennessee and I’ve been thinking about Spring and flowers. DIY Hanging Flower Pot. This is the bird feeder upcycle. I found the bird feeder at the Nashville Flea Market and fell in love with it at first sight. I find it hard to resist anything red. I get that from my mother. Wheelbarrow Planter. This project has me smiling. I need an old rusty wheelbarrow! I would fill mine with beautiful flowers and maybe some kind of trailing vine. Pallet Vertical Garden. When you don’t have the space for a garden in the ground, why not use an old pallet or two? Very creative thinking here. I love the chalkboard paint idea but I wish the “garden” would have been filled with plants instead of just one small container. Vintage Floor Lamp Planter. This idea is so cool! Whoever thought of it is a genius. I saw this on Pinterest and the pin goes to Etsy but the lamp planter is no longer there. Vintage Toddler Potty Flower Potty. I love the creativeness of this outdoor plant container. It’s a great use of something old and turning it into something new. And if nothing else, it’s an awesome conversation starter for people visiting your home. Vintage Metal Ice Chest Flower Container. This is another of my unique container ideas. The vintage metal green ice chest had planter written all over it. DIY Bistro Light Patio Planters. Okay, this project takes some work. If you have a patio that needs lighting you can make this project that includes built in flower containers. Painted Terra Cotta Pots. Terra cotta pots are just ho-hum but you can make them unique with a bit of paint. 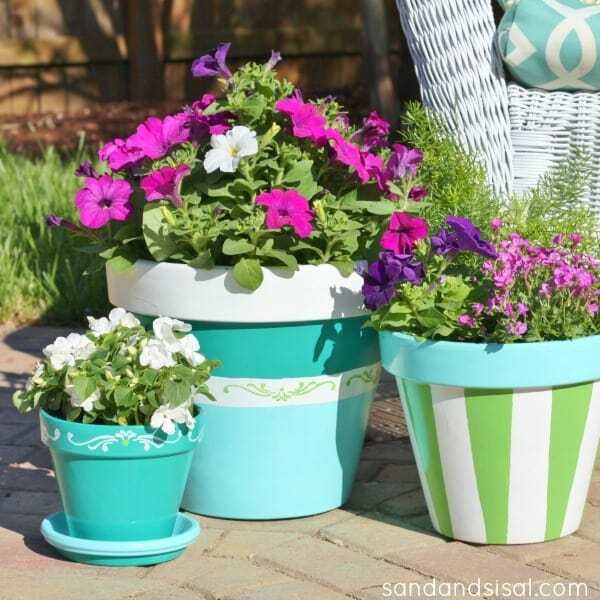 I love the color of these pots and they even have a stenciled design. DIY West Elm Inspired Succulent Planter. Another terra cotta pot paint makeover. This time it the paint was inspired by a designer look spotted at a high end home store. 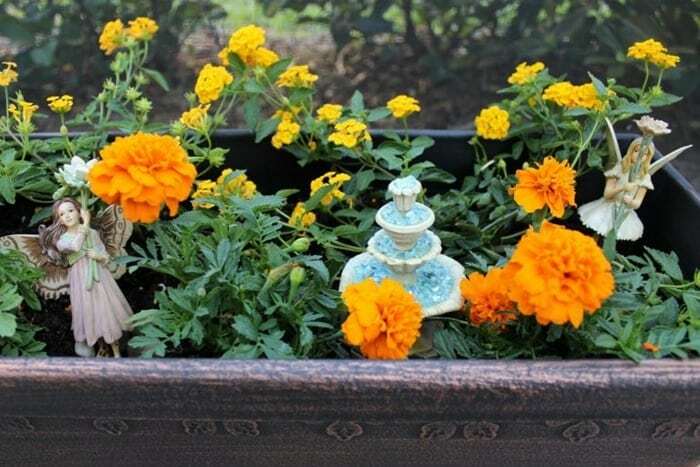 The makeover is easy and the pot will look great in any outdoor space. Address Number Flower Pots. Fun and unique way to showcase your house number and your outdoor plants at the same time. Privacy Planters with Lattice. This is another build project. The planters have a lattice addition that offers privacy where needed. Cast Iron Sink Plant Container. This container is the marriage of two vintage things……a cast iron sink and an vintage iron sewing machine base. I want to try this idea for sure. Well Loved Bucket Makes a Cool Flower Pot. My project! Just a simple galvanized bucket. I found it at the junk shop and it was beat up and bent up. The JTS drilled holes in the bottom and I added a pretty flowering plant. Dressing Up Nursery Planters. This DIY is a great way to use what you have and save some major money as well. Just a bit of paint and creativity is all you need. DIY Mini Fairy Garden. A super fun outdoor plant container idea that the whole family can help with. Have fun decorating the container with fun finds and fairies and anything else that you see fit. What was your favorite from the projects shared today? That’s a hard one for me. I think the floor lamp planter and the cast iron sink are tied for first. When you’re shopping at the junk shop or wherever for your own unique outdoor plant containers remember to thing outside of the box…..or container. Would you have looked at the red bird feeder and pictured a hanging planter? You are very welcome Holly. 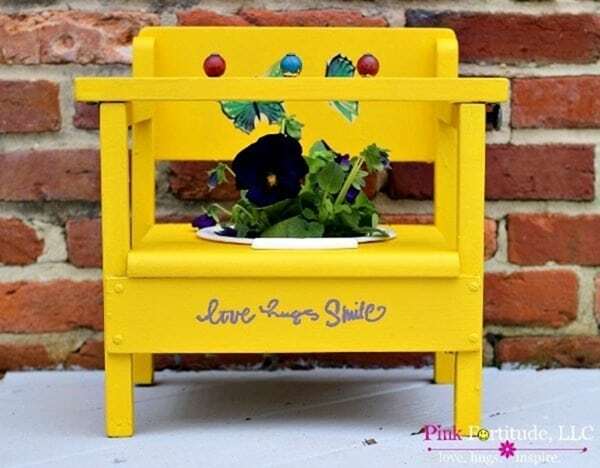 That is the cutest potty chair makeover I’ve seen. I’ve always been a fan of yours too. Lots of fan love going on here, lol.